The 'Holi' festival is a very fun-filled and popular occasion in India. People play holi with Chandan and colored water. This festival is celebrated around early March each year. People believe that the bright colors represent energy, life and joy. 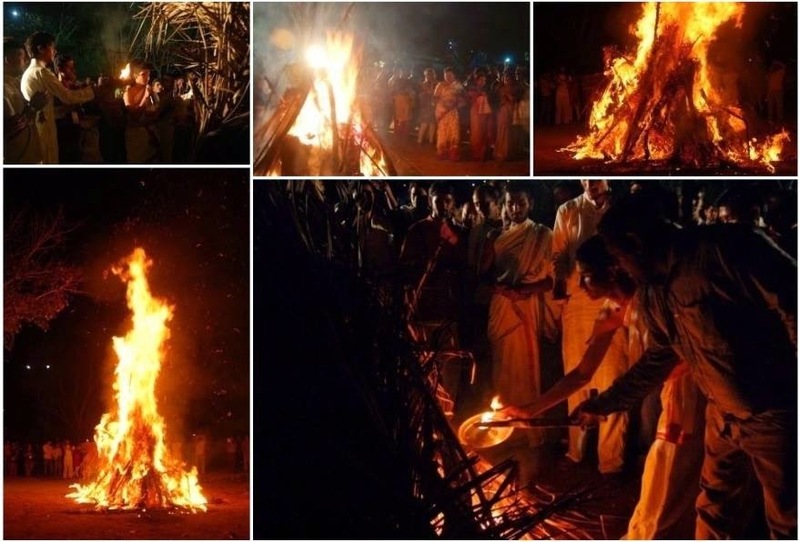 Huge bonfires are also burnt in the evening and people worship the fire. An asura king, Hiranyakashyap, wanted everyone to worship him. But his son Prahalad was a devotee of Lord Narayana, the king's sworn enemy. Angry, the king wanted Holika, his sister to get rid of Prahalad. Empowered to withstand fire; Holika sat on a burning pyre holding Prahalad on her lap. But it was Holika who was burnt, Prahalad came out unharmed. Hiranyakashyap symbolizes one who is gross. Prahalad embodies innocence, faith and bliss/joy. The spirit cannot be confined to love material only. Hiranyakashyap wanted all the joy to come from the material world. It did not happen that way. The individual jivatma cannot be bound to the material forever. It’s natural to eventually move towards Narayana, one's higher self. Holika stands for the past burdens that try to burn Prahalad's innocence. But Prahlad, so deeply rooted in Narayana Bhakthi could burn all past impressions (sanskaras) and joy springs up with new colors. Life becomes a celebration. Burning the past, you gear up for a new beginning. Your emotions, like fire, burn you. But when there is a fountain of colors, they add charm to your life. In ignorance, emotions are a bother; in knowledge, the same emotions add colors. Each emotion is associated with a color- Anger with red, jealousy with green, vibrancy and happiness with yellow, love with pink, vastness with blue, peace with white, sacrifice with saffron and knowledge with violet. Knowing the essence of the festival, enjoy the day with Wisdom.